This crochet shawl is a triangle shawl and perfect for cooler weather! Nothing can keep you warmer on snowy, windy, winter days than this cozy hand crocheted tassel shawl. A perfect addition to your Fall and Winter wardrobe. Treat yourself. 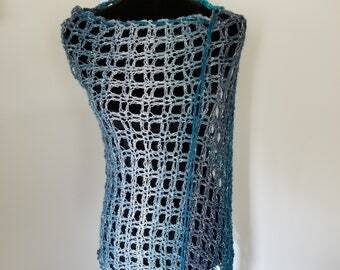 This Bohemian scarf can be worn across your back for warmth or or tied in front like a scarf. A striking puff stitch accents this scarf which is triangular in shape and has nice big fluffy tassels on each end. It is crocheted in blend of acrylic and wool yarn in a multicolor combination including different shades of browns and gray. 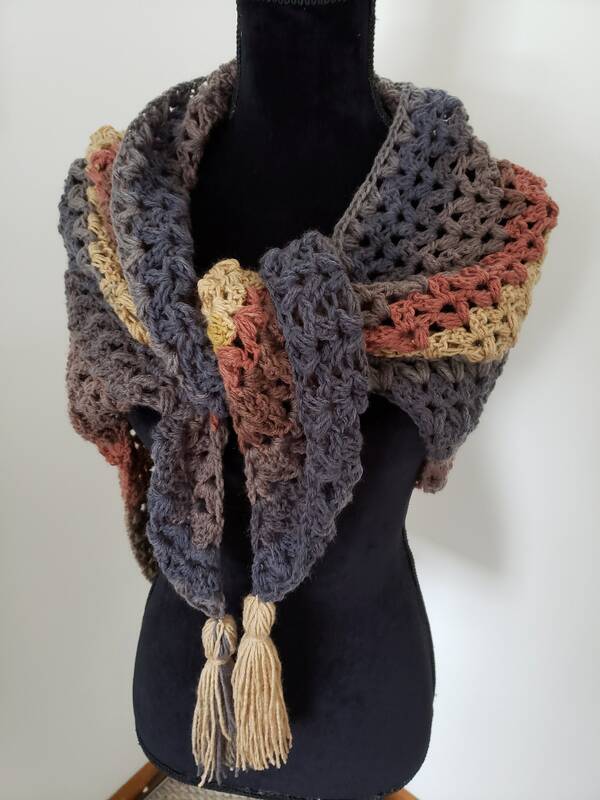 This scarf will pair up nicely with your winter jacket or coat, with jeans and a jean jacket for a Bohemian or Victorian look or the sky is the limit. It measures 39" in length (including tassels) and is 70 inches at it's widest point (including the tassels). I loved this shawl so much, I even crocheted one for myself. I wore it with black jeans and gray top to a get-together and received so many compliments. I love it. So treat yourself. This is a custom made scarf. So please add a week to delivery time. Also please note that this is a variegated yarn and the color scheme may vary slightly from one shawl to another.